Every aikido dojo has a picture of Morihei Ueshiba (O-Sensei) mounted on the front wall of the dojo. As an old man, the venerable founder exudes compassion and enlightenment. At Ikazuchi Dojo, we have a fantastic picture of O-Sensei in his late 70s or early 80s, smiling, but with a piercing gaze. 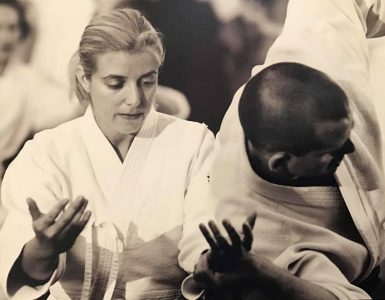 This is how I, and most aikido practitioners, have come to know O-Sensei – a man near the end of his life, at the height of his wisdom and understanding. Stan Pranin Sensei, founder of Aikido Journal, recently gave me the opportunity to view a portion of his archives. It’s breathtaking in scope. I began looking through his vast collection of Morihei Ueshiba photos and came across one that captivated me. Instead of seeing an old man, I found a strong, focused man in the prime of his life with an intense and steely gaze. I came to learn that O-Sensei was 45 when the photo was taken. I asked Stan about the photo and he shared the story behind its acquisition. Stan was training directly under Saito Sensei in 1979 and on a visit to Saito Sensei’s home, he showed Stan the 1928 O-Sensei portrait. Stan was blown away and asked permission to take the photo to be reproduced. Saito Sensei agreed. Stan gave the photo to his assistant at Aiki News to take to a photo laboratory. Stan was stunned when his assistant returned to inform him that something had happened on the train and she had lost the photo. Stan had no idea what to tell Saito Sensei. He said it was the most embarrassing moment of his life and he couldn’t muster the courage to tell Saito Sensei what happened. He never mentioned the photo or its loss to Saito, who in turn, never asked for its return. Years later in the 1990s, Stan was interviewing the son of Tsutomu Yukawa, a man that studied under O-Sensei in the 1930s. Stan asked if he had any pictures of his father or of O-Sensei. He presented Stan with four photos, one of which was a copy of the 1928 Ueshiba portrait. Stan personally saw to the restoration and reproduction of the photo. Original and restored versions of the 1928 photo. Shortly after, Stan traveled to Iwama and returned a copy of the photo to Saito Sensei – only it was in better condition than the one Saito had given him. He apologized for taking so long to return the photo (over a decade), but Saito Sensei seemed only grateful to see the photo again. I asked Stan if he ever told Saito Sensei that he had lost the original photo. Stan said he couldn’t. He was just too embarrassed. We had a good laugh over that. A Place for a Younger O-Sensei at the Shomen? Almost every aikido dojo I’ve visited has a picture of the venerable founder, Morihei Ueshiba, mounted on the shomen (front wall / center of the dojo). The picture always features Ueshiba as an old man in his late 70s-early 80s, at the peak of his wisdom and accomplishments. It’s a great way to remember and honor O-Sensei. However, with access to high quality portraits of the founder in his 40s and 50s, I wonder if there’s a place for a younger O-Sensei not just in the dojo, but at the shomen. 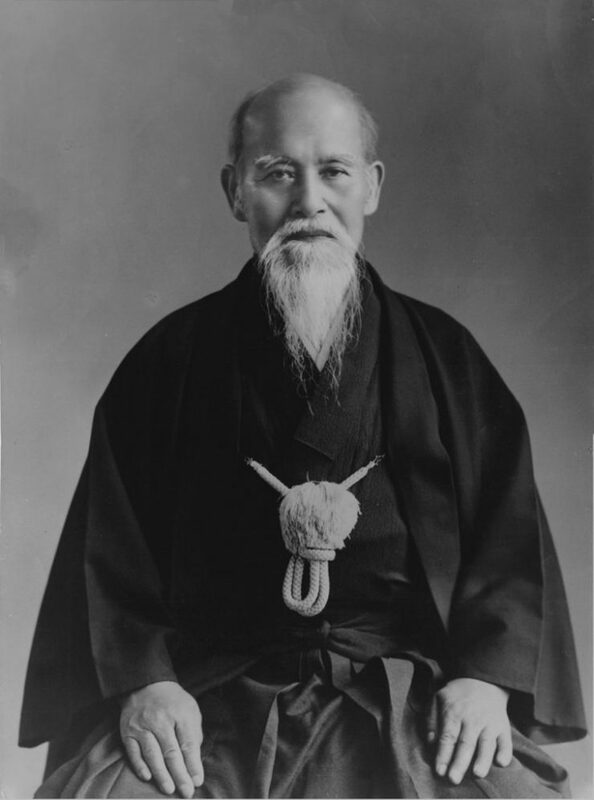 In his prime, Ueshiba projects vitality, unlocked potential, and the promise of profound creation. The 1928 photo captures O-Sensei when he had just moved to Tokyo to dedicate himself full time to the martial arts. He had yet to create aikido, but would soon embark upon a profound journey developing the art. Should the portrait on the shomen only show O-Sensei after aikido was formally created? Only after he fully completed the period of reflection that led to the philosophy underpinning modern aikido? Does it matter? Are there other reasons to only use photos of him in his later years on the shomen? I don’t have an answer or even a strong opinion, but am intrigued to hear the community’s insights. Please leave us a comment and let us know your thoughts. Special thanks to Stan Pranin Sensei of Aikido Journal for providing us with this beautiful portrait and the opportunity to have a dialogue about the founder, especially during a critical time when he was focused exclusively on his battle with cancer. Fantastic story, and photo. Thank you. Well, in regards to which likeness to have, it ultimately lends itself to where one is in his/her place. A younger Osensei in my view right now, would celebrate the creative genius at work in the formative years. So, in a new dojo, this would represent promise and creativity ahead. Thank you very much for this publishing this photo and for article. I am 41 and this photo has inspired me to practice more and aspire to be where I can be in four years (although I’m not sure if I can be on Osensei level). Thank you once again. Thank you for sharing this story! I would not have been able to tell him I lost the photo either. Wow, thank you forsharing this! Is there any chance to get it in higher quality (as a file or even printed)? My Sensei Dave O’Brien has been looking for a young O Sensei for our dojo (Takama Hara Aikido) for years. Where can I get a copy either electronic and I’ll get it printed or as purchased print. More than anything, this story demonstrates to me once again how much class Saito Sensei had. Knowing the power imbalance in his relationship with Mr. Pranin, he did not want to place him in an uncomfortable position by requesting the return of the photo. I did not know Saito Sensei at the time, and have never met Mr. Pranin, but I often heard of their relationship. If Saito Saito Sensei had even a fraction of the insight into his deshis that I witnessed in his later years, then he would have intuitively known that if Mr. Pranin was not returning the photo promptly, it was because he was prevented from doing so for some reason. He would also have known that Mr. Pranin would therefore be tremendously embarrassed by his inability to return the photo, for whatever reason that may be. Saito Sensei was very careful with the heirlooms of O-Sensei. There is no way that he would have ‘just forgotten’ about such a photo. It would have been very dear to him. That he would never mention it for a full decade shows the extent of the respect that he had for Stan Pranin and his profound selflessness in the manner in which he managed himself and his entourage. 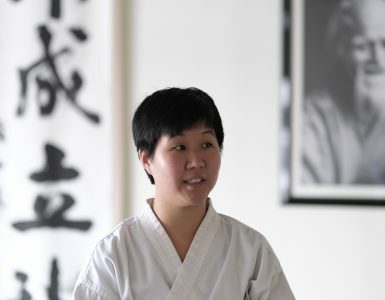 It is a very interesting point of view that was shared in this article.It is definitely at the discretion of the individual to choose a younger or older picture of O – sensei however in the Japanese tradition, it might be seen as disrespectful. This picture is a great example of the many reasons I love Pranin Sensei’s invaluable work. And even more so enriching with the back story. This portrait would definitely give a refreshed and inspiring look to a Dojo’s shomen. I would like to know if someone can say with certainty why showing this portrait or not showing the usual portraits of O’Sensei in his later years would be perceived as a sign of disrespect. It’s nice to see the photo finally being used. I’m the one who did the photo restoration for Stan all those years ago. Wow! That’s fantastic. I’d love to hear more about it. I’ll see if I can find you on Facebook and connect. You should be happy to know that many people now have access to that treasured photo and are extremely appreciative. Thank you for your work on this priceless piece of aikido history. You are most welcome Joe! I believe the smiling O-Sensei photo is from the collection of W.G. von Krenner. We’ve had this photo at the shomen since I started training in 1991. Now that we’ve consolidated the AJ digital archive, I know we have most or all of the collection in very high resolution format. However, usage rights are not clear at this time. It’s something we will be looking into. Walther von Krenner trained directly with O-Sensei and has written some interesting books. I’ve read his Aikido Ground Fighting book and plan on checking out his Atemi book at some point in the near future as well.